Status: offline It is not indicated on the films. They were conducted in supine. What does "CS"(on the film marker)indicate? UTDC is correct. CS are the technicians initials on the "Mitchell Marker" which is partially obscured because of my poor cropping of the digital picture. Sorry for the confusion. Status: offline No problem Alex- This is a "learning" forum. I've not seen that before, and did not know what "CS" meant. I have now learned something new!!. Another question: Is there some reason the "supine vs standing" info was not recorded on the film? I don't want to appear dogmatic- but failure to document this info via markers, would have been given a "fail" grade in DC school. Perhaps this is not important info to others? Perhaps this info was on the films, but not visible on the above submitted films? For discussion purposes only- I only know *that* which I was instructed in, and things may have changed since my formal x-ray ed.?? Alex-----Your efforts here, are personally appreciated. Thank-you for your time and effort required to make this available. The marker has two small metal ball bearings in it. That portion is obscured per Alex's note above. In a weightbearing film (such as AC series, WB series of joints), the ball bearings are at the bottom of their circular container. In a nonweightbearing film, such as these, the bearings will appear in the middle of the container. Each Xray tech has markers with their initials, a circular area where the bearings are kept, and the letters "R" and "L" on them. They use one of these markers on every film so you know what side is right or left, who shot the film, and if it is weightbearing or not. Status: offline I still don't see the L1 spinous fx, although I know Alex posted this with some pathology in mind. I'll call 'em as I see 'em, and although there has to be something funky going on somewhere, I just don't see it. Don't see a compression fx, don't see clinically significant rotation, doggone it I don't see much to speak of at all. I'm looking though. Little hypolordotic lumbar curvature that I'm sure will come back to bite me. Part of the learning experience is to be honest about what we see/don't see. We're all trying to learn what we can, and I won't make fun of anybody even when I think they're missing something obvious. But Alex, feel free to mock me a little, I'd mock me too. Status: offline [QUOTE]The marker has two small metal ball bearings in it. [/QUOTE]That is the marker I was taught to use(without fail), and personally used,(back in the days, when I used to take my own films), on EVERY film I took. Failure to do so was an automatic fail. However, that was in the days of "8 tracks"! I did not see one on the above films. However, in addition to the "right" I am familiar with, and understand, ---"CS" was noted. HMMMM.....I don't remember anything about "CS" in rad/clinic.....back in the "8 track" days" Am I getting "out-digitized"?........or is this some new marking system?.......HMMMMM? CS?...........HMMMM?........"CS? "......Alex said the patient was supine..........HHHMMMM????? CS? *C*orpse *S*upine?...........possible????HHHMMMM????? Status: offline wow no kidding. Status: offline Well I don't see any of you inquiring as to what CS might be- Lighten up----GEESH!! I couldnt see the Fxr itself due to image quality(I said possibly a fxr)due to 1. the mech of injury 2. the way the upper dorsal really anterior tilts. almost as if its a flexion film, a compression frx would fit at that level. If it did evidence it self on plain film I would follow up with a lower dorsal scan to see if its active. I would try and coordinate all the "possible" infor off the film with the physical pres. off to meetings have a great day all! Status: offline The purpose of the history of this study was to draw your attention away from the small round densities in the lower pelvis. There is no fracture in this study. There is no lytic or sclerotic lesion, with mild limitation in evaluation by overlying bowel gas. There is no significant disk space narrowing,with no significant degenerative changes. No fracture or subluxation observed. 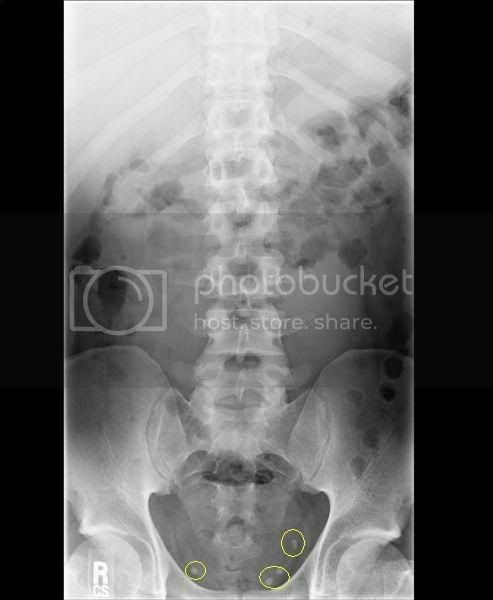 Small densities, most likely phleboliths, are visualized in lower pelvis. Recommend to correlate these findings clinically. So the question is, what are phleboliths and should we be concerned? As a PT would you refer back to the physician? Is this worth a call to the referring physician? Status: offline I believe they are calcifications in the pelvic veins. If they are large enough to cause an obstruction, perhaps they verify this with further followup imaging studies.